If you’re new to script writing, getting started can be a daunting task. Creating an accurately formatted screenplay requires scriptwriting software. Some of the options out there can cost a bundle. We’ll take you through all the screenwriting software options, from free to a fortune, so you can decide which script software is best for you. First off... it is completely FREE. Create as many scripts as you like and write an unlimited amount of pages. Our feature guides you through the writing process, and teaches you the industry standard format that has been used by professionals for decades. While you write your script, you can simultaneously tag all of the elements like props, costumes, or any other requirement for your scene. They will be labeled by color, and automatically show up in your scene reports. What if you're responsible for more than writing the script? Do you also produce or direct the content? This gives you the tools to manage your entire production all in one place. Develop and write your content, sync your script, breakdown the scene requirements, shot list and storyboard, schedule your shoot days, manage locations, add cast and crew, and send out call sheets all in StudioBinder. ​​​​​Collaborate with your writing partners wherever, and whenever you like. Made a change to your script? 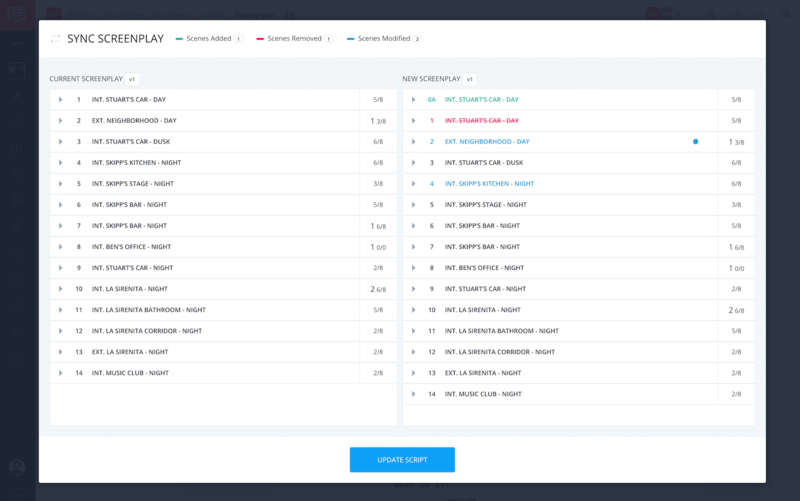 Just hit "sync" to update all of your script changes into your production plan, and watch your schedules and shot lists change in a second. StudioBinder's screenwriting software is FREE. Try out StudioBinder's free screenwriting software and see for yourself. Celtx is a great place to start. It’s a script writing app for beginning screenwriters who want free screenwriting software. It’s a simple program to use and will help put you on your way toward your career. Start with a basic screenwriting software. 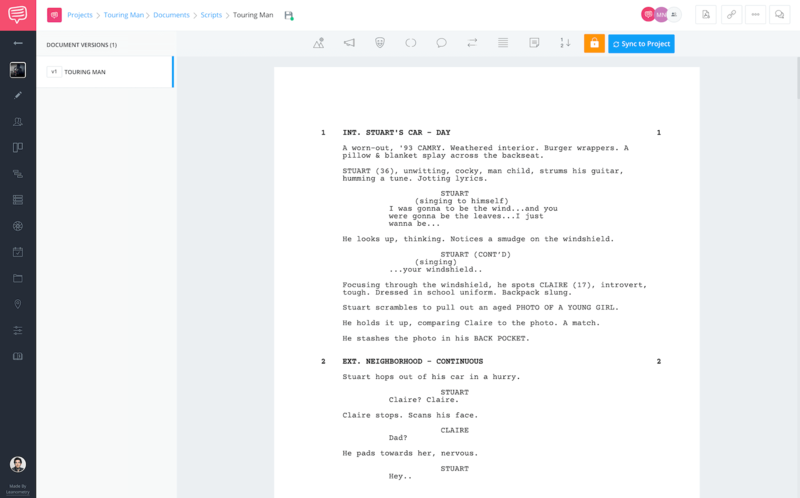 Celtx has expanded itself from an online, free script writing software, to a pre-production suite. That can cost upwards for $249, but you can start out with the free screenwriting software and upgrade later. This script writing software can handle most of the tasks involved with preparing for a production. Because Celtx is web-based, all your scripts are stored on the cloud rather than a hard drive. This makes adding collaborators and writing partners easy, as well as storage. WriterDuet is another web-based, free screenwriting software, which prides itself on its intuitive keystrokes to help your stories flow from your brain to your fingers, and to the screen. It’s also some of the best script writing software on the market. It’s free script writing software, Mac or PC. This is a great screenwriting software for you and your writing partner. WriterDuet has fewer production capabilities. It's more specialized for script writing rather than expanding into other production needs. It's also on the web and has built-in collaboration features for you and your writing partners. That’s useful, especially if you’re not in the same room. Still, it dampens your writing capabilities without wifi. Both WriterDuet and Celtx are great resources for beginning writers who want to learn how to write their movie script without the entry costs of script writing programs like Final Draft. That’s right, but it’s not technically free. Highland offers lots of “in-app” purchases for special tools and formats. The professional package is $49.99, and certainly, it’s the most inexpensive of the professional tools. This is screenwriting software made by a pro. Highland comes out as a Fountain file, but you can also export as a PDF or even change the file type to a FDX. You’ll hear Final Draft called “the industry standard” for screenwriting software. And they expect you to pay for it. Currently, the latest version of Final Draft is $249.99. So how did Final Draft get to be the most widely used screenwriting software? Tried and true screenwriting software. Final Draft is the most commonly used. The easiest answer is that they’ve been around the longest. Nearly every show and studio uses Final Draft. While it's also the most buggy, it has the easiest user interface to navigate. They also are constantly updating the software with new features. Upgrades usually cost around $99. While they’re not necessary, they do offer new and useful things from time to time. You heard Final Draft was “the industry standard?” Well, Fade In bills itself as the “new industry standard.” Shots fired! At only $79, Fade In is making its run at Final Draft’s market. Relatively new, and more efficient than Final Draft, Fade In is the script writing software becoming preferred by those who don't have to bend to the standards of studios and networks. Fade In has fewer bugs and crashes less than most of its competitors and a lot more features. Check out their screenwriting software comparison sheet below. The challenger for the “best screenwriting software” title. The archaic monolith of Hollywood is so averse to change, though, that Final Draft still has such a strong foothold as the standard. Still, there are plenty of pros who have made the switch to Fade In. Remember, no matter what you use; it’s the story that counts. What features determine the best screenwriting software? A very capable and easy to use script writing software, Movie Magic Screenwriter is the Windows to Final Draft's Mac. While Movie Magic has the capability of syncing with a production planning software, it is NOT free, and it requires a different purchase from your actual production planning software, which leaves something to be desired. If you want something more advanced, but with fewer bugs and crashes than Final Draft, Movie Magic Screenwriter is the script writing software for you. While it may not have the popularity, it's still more prevalent in the industry than the others, such as Fade In or Highland. Start writing your script today! You have a script idea ready to write, and you want to begin as soon as possible. No need to wait, because we have a free screenwriting feature waiting for you. Check out the link below to see for yourself. Whats your blog url. Would be interested to read it.